Particle board, a material most commonly known for its usefulness in construction projects, can be found in many places. It's easy to find in trash piles at construction sites or by recycling building supplies from homes and can be used in a variety of projects. Structurally sound used particle board can be used for arts and crafts projects, building and anything new particle board is useful for, although you may have to take a bit more care to ensure that it is sound and usable. Find good quality particle board. The board should not be frayed or water damaged. Sources for particle board include home construction, building supply resale shops, junkyards and even dumpsters. Decide what you will use the board for. A frayed or rough board may be appropriate for an art project, but a construction project will demand a strong, undamaged board. Extremely damaged boards can be taken to a recycling center where they may be turned into other products, such as paper. Clean and prepare your board as necessary. This might consist of sweeping or brushing off dust or mud, sanding or painting. Create your project taking advantage of the particle board's unique properties: its look, texture and strength. 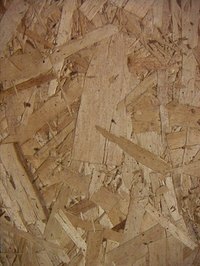 Particle board has recently become a very popular material and is particularly used in “green” homes and offices in a variety of functions. It can be used as a cheap alternative to wood flooring (although sanding and sealant is needed to smooth rough wood), on counter tops and as walls. Particle board can also be used to create furniture, such as tables, shelves and chairs, as well as a free or cheap alternative to canvas for artists. What Are the Dangers of Particle Board?